The old rules no longer apply. Digital technologies have radically transformed the business landscape, yet many organizations have completely ignored this reality. A new survey of IT decision makers found 96% see digital transformation as important or critical, yet 55% say they have one year or less to respond before they financially suffer. By failing to prepare for new technologies, devices and systems, organizations have threatened their own survival. 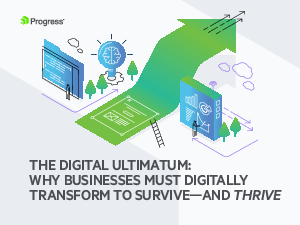 The Digital Ultimatum, is your first step towards building a future-proof organization that optimizes the customer experience and routinely achieves organizational excellence.